1. Sky shareholders cheer: A great day for Comcast is turning into an even better one for Sky shareholders. The American cable giant outbid 21st Century Fox (FOX) and its powerful backer, Disney (DIS), on Saturday in an auction for control of the European pay-TV broadcaster. Comcast's (CMCSA) final bid was £17.28 ($22.65), valuing Sky at £30.6 billion ($40.1 billion). That was way up on its previous offer of £14.75, and Sky's closing share price on Friday. The stock moved fast Monday to catch up, gaining over 8.5% to £17.22 ($22.58) in early London trading. Two big unanswered questions: What will Fox to do with the 39% of Sky it owns? And what will Comcast shareholders think of the price CEO Brian Roberts paid for Sky? 2. A bigger conflict: The trade fight between the United States and China intensified Monday as the two economic superpowers hit each other with their biggest round of tariffs yet. The Trump administration imposed new 10% tariffs on $200 billion of Chinese goods just after midnight ET, spanning thousands of products, including food seasonings, baseball gloves, network routers and industrial machinery parts. 3. Huge gold deal: Barrick Gold (ABX) has acquired Randgold Resources (GOLD) in an all-share deal that creates a mining giant with a major presence in the United States and Africa. Barrick shareholders will own 67% of the new company, while Randgold shareholders will own 33%. The market value of the combined firm is $18.3 billion. Randgold CEO Mark Bristow will become president and chief executive of the merged company. John Thornton of Barrick will be executive chairman. European markets were down in early trading. Hong Kong's Hang Seng dropped 1.5%, while benchmark indexes in Shanghai and Tokyo were closed for holidays. 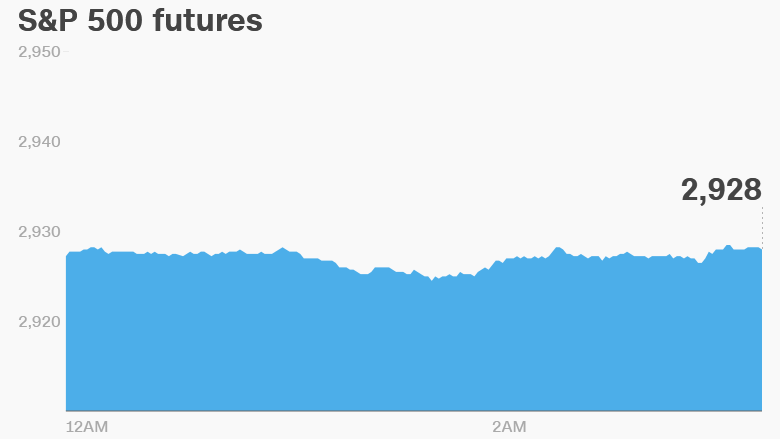 The Dow gained 0.3% on Friday, while the S&P 500 inched lower and the Nasdaq declined 0.5%. 4. Companies and economics: Shares in Thomas Cook plummeted nearly 25% after the UK tour operator warned that unusually hot weather would dent its earnings. Ascena Retail Group (ASNA) will release earnings after the US close.